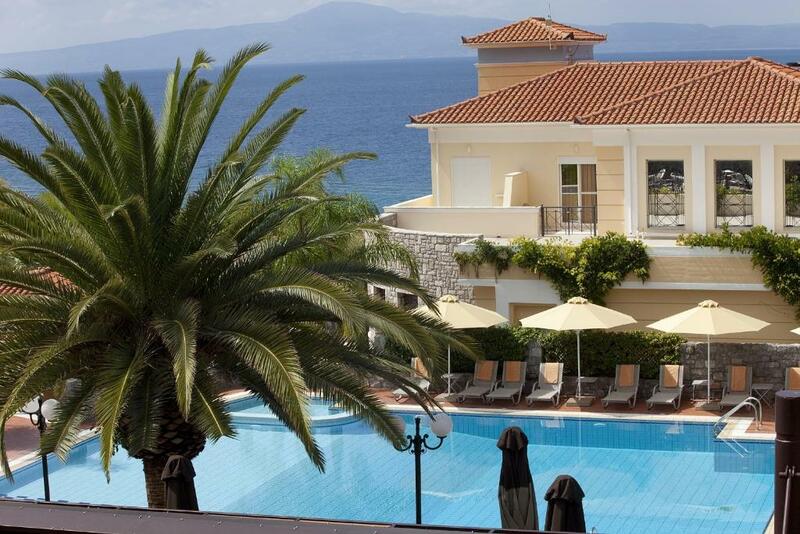 Lock in a great price for Akti Taygetos - Conference Resort – rated 8.2 by recent guests! On the property restaurant,price inclusive of dinner & breakfast. Kitchen/dinning staff was nice. Rooms were okay. The resort grounds were very nice! Very family friendly and pool was great also! "Beach" was small but very private. The Ocean in that area was clean and surprisingly warm...kids loved it! Staff were very accommodating also! Friendly and helpful staff, small but quiet beach with privacy, clean rooms, wifi available, beach bar with great view, breakfast adequate, amenities available. Beautiful spacious and very clean.. the food by the pool was great aswell! Breakfast too was beautiful especially that frappe was included!! Clean hotel, comfortable room with much space, kind staff. Convenient for parking car, good breakfast and buffet dinner. 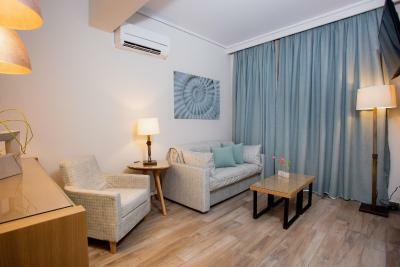 Very reasonable price for the value Not very close to Kalamata, a car is necessary, but we knew it, and as counterpart going to Kalamata is rather quick and you avoid traffic and parking problem. I would appreciate some real coffee at breakfast (instead of instant machine coffee). The Greek coffee was a nice touch though. Akti Taygetos - Conference Resort This rating is a reflection of how the property compares to the industry standard when it comes to price, facilities and services available. It's based on a self-evaluation by the property. Use this rating to help choose your stay! Located at the foot of Mount Taygetos and at the heart of the Messinian Gulf, Akti Taygetos - Conference Resort is a few feet of the beach and features a large swimming pool with hot tub, and a private beach area. The property includes 3 bars, one of which is beachfront, and 2 restaurants and offers free WiFi access throughout. The center of Kalamata is 3.7 mi away. Opening to a balcony with lovely views to the sea or the hotel’s lush gardens, the units at Akti Taygetos - Conference Resort feature minimal decor and soft colors. They are equipped with a flat-screen satellite TV, mini fridge, safe, hairdryer and air conditioning. Free toiletries are also included. 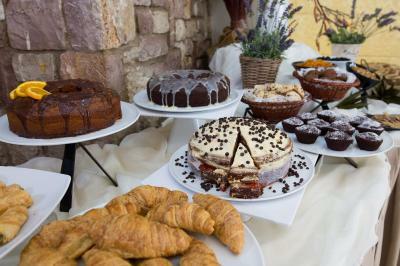 A rich buffet breakfast including traditional products is served at Amymoni restaurant. The a-la-carte restaurant Anassa serves authentic Greek dishes and grilled steaks by the pool. At Red Roses bar, guests can choose a cigar from the wide variety offered and enjoy the oriental atmosphere. Offering unique views, Costa-Costa Bar on The Beach is ideal for a cool drink, exotic cocktail and snacks under the sound of chill-out music. A private beach lies right in front of the hotel featuring sun beds and umbrellas. Private on-site parking is provided free of charge. When would you like to stay at Akti Taygetos - Conference Resort? This room includes a balcony offering lovely views of the hotel’s lush gardens or the Messinian Gulf. 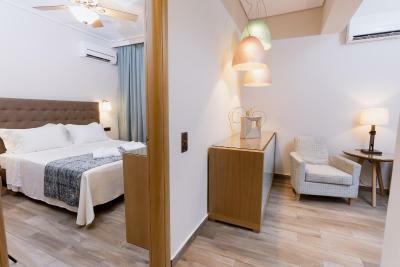 This luxurious junior suite features a sea view, hi-fi stereo facilities, designer toiletries, bathrobes and slippers. 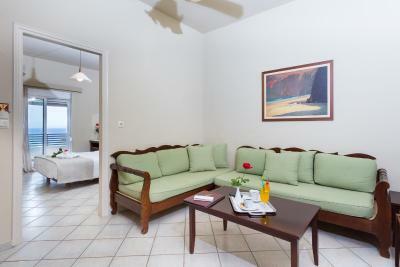 This bungalow features a balcony, tile/marble floor and flat-screen TV. House Rules Akti Taygetos - Conference Resort takes special requests – add in the next step! Akti Taygetos - Conference Resort accepts these cards and reserves the right to temporarily hold an amount prior to arrival. -the beach bar Costa Costa is open from 15/6 to 16/9. Please note that above info may change due to weather conditions. Double bed just 2 singles made singly and pushed together, mattress very very hard well beyond firm and uncomfortable. Bed linen kept slipping off the bed. An uncomfortable night with poor sleep, not value for money! Basically, everything is fine with the hotel, it's just my expectations (i thought it's sandy beach, but it's not and you had to cross the road to get to the sea). The location is beautiful - the mountains from one side, and the sea across the road. The beach, which belongs to the hotel is real stony beach, and we felt fine when got these special shoes, but the view and nature around and waters in the sea are so beautiful, the view from the bar are so breathtaking that you kind of reconcile with the idea that sandy beaches are somewhere you need to take a ride (some 10 mins by car). i booked a bungalow for three people, my partner, my daughter and myself, so it was a bit inconvenient that all three beds are in the same space (and it was not clear from the description of the bungalow). But it was very clean, the cleaning ladies are very nice and kind, visited us every day, toiletries provided of a good quality, towels changed every day. Breakfast was also nice, served at the open terrace. Upon request it was possible also to have lunch or dinner right there, but we've chosen to go around to one of the numerous taverns. It's better to have a car, while you are there, to have a bit freedom and chances to travel around. the mattresses! They were very hard and uncomfortable. I have stayed in 4* resort hotels before and slept much better. We were both very disappointed with the quality of the mattresses. Also, we had a bungalow style room- the kitchen area had no silverware, cups/glasses- nothing. We would have had to bring everything to handle anything we brought- we are not going camping! Is this 4* quality? I understand they are worried people take things- but as in any other hotel, a simple sign that guests are responsible for what they consume/take, with prices etc. Also, there was no place to hang wet bathing suits- when windy, leaving them outside hanging over the balcony is not safe. Room could be a liitle more spacious. Came to a hotel that a first looked nice, and from there the problems started. Got a room with a broken toilet, a fridge that soaked the whole floor and a bed with the metal spring sticking out. Had to fix the toilet myself so at least I could flush it a little bit. Wiped the floors from the leaking fridge myself and had to sleep 2 people on one side of the bed ... We notified the staff but nothing was done and next day at check out when I told them again they still expected full pay! The only positive thing in this hotel was the service minded and hardworking pool bar guy ! The first time I ever had to write such negative review in Greece ! Thank god this is not the norm in Greece ! The beds were hard and the pillows both oversized and hard and the room had no cooking facilities, not even for coffee and tea. It did however have a refrigerator and a kitchen sink as well as a kitchen fan as a reminiscense maybe of that.